Although born in Blackpool in 1923 Ronnie Clayton was one of the most popular boxers on Merseyside during the 1940’2 and 50’s. He was one of a surprisingly large number of boxers who made their debut during the Second World War – a draw at Blackpool in January 1942, when he was 18 years of age. Eight wins in his next eight contests were to follow before he was defeated in a 8rd points loss to Norman Lewis. 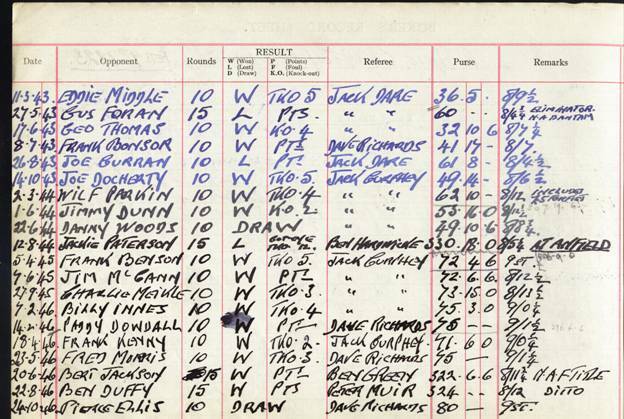 This was an remarkable result however as Norman Lewis was one of the gamest boxers then active in Britain. 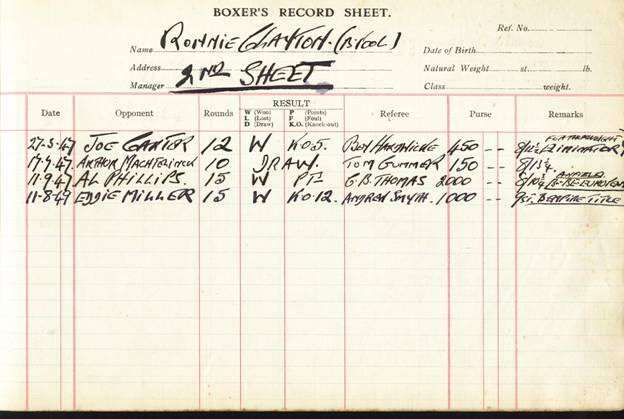 Just one more defeat followed in his next 24 fights ( he had 31 fights before he reached his 20th birthday ) marked Ronnie out as a more than capable bantam before he was outpointed by another Liverpool favourite Gus Foran for the Northern Area Title in 1943. Ronnie’s two brothers, Jackie and Syd , could usually be seen in their brothers corner but the boxed themselves and managed to combine the roles on a war time show in Liverpool. At one of the famous Sunday shows on 19 July 1941 all three brothers were to make winning appearances. 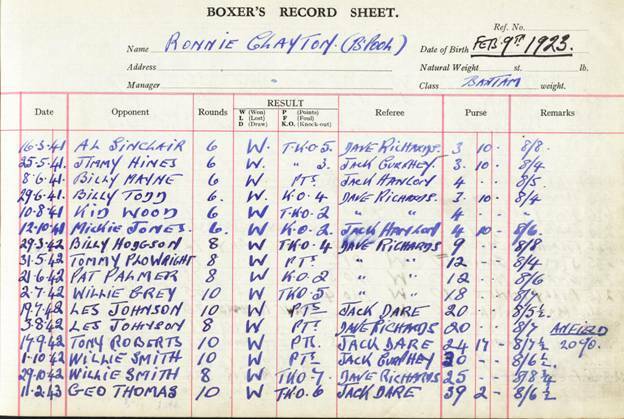 Ronnie topped the bill and outpointed London’s Les Johnson over 10 rounds.. Jackie ko’d Jack Cowley in the 8th and Syd outpointed Liverpool’s Eddie Monahan. His service with the Fleet Air Arm did not stop Ronnie from making numerous appearances in Liverpool the most notable being his points defeat against Joe Curran in August 1941., and his 12th round retirement against the future world champion Jackie Patterson a year later. This later contest was an eliminator for the British Empire bantam title and was watched by some 18,000 people at the Anfield football ground in Liverpool. This was one of two boxing shows held at the ground during the war period. Wins over Paddy Dowdall , Bert Jackson, Ben Duffy followed before Ronnie won the British Empire and European featherweight titles in September 1947 with a points decision over Tiger Al Philips at Anfield.Ronnie picked up £2000 for his trouble. Six months later Ronnie lost his European title to Ray Famechon ( France) in Nottingham with a points decision over 15rounds. In a return contest in November 1949 he suffered the same fate in Manchester. In 1942, a badly cut eye in the 5th, ended their three bouts series. Ronnie continued to box until 1954, and although there had been talk of him challenging Willie Pep for the world title, which never took off. By this time he had defended his British title against Johnny Molloy ( St. Helen’s) in a 15 round points win at Nottingham. Dai Davies ( a 5th round stoppage) and Freddie King ( a 4th round stoppage at Harringay). 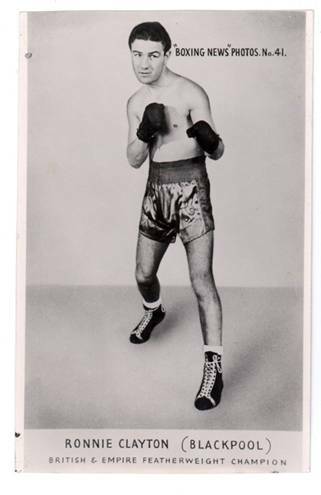 Ronnie then lost the title to Sammy McCarthy ( London) in what turned out to be his last fight when he retired at the end of the 8th with double vision. The Londoner was some 9 years his junior and had been a pro for 3 years with Ronnie clocking up 13years. Ronnie also defended his Empire title against the Australian Eddie Miller and British Guinea’s Roy Ankrah, to whom he lost in 1951.